Ganglion cysts are idiopathic, but presumably reflect a variation in normal joint or tendon sheath function. Cysts near joints are connected to the joint and the leading theory is that a type of check valve forms that allows fluid out of the joint, but not back in. The cyst contains clear fluid similar to, but thicker than, normal synovial fluid. They are most often found around the wrist joint, especially at the scapho-lunate joint, which accounts for 80% of all ganglion cysts. 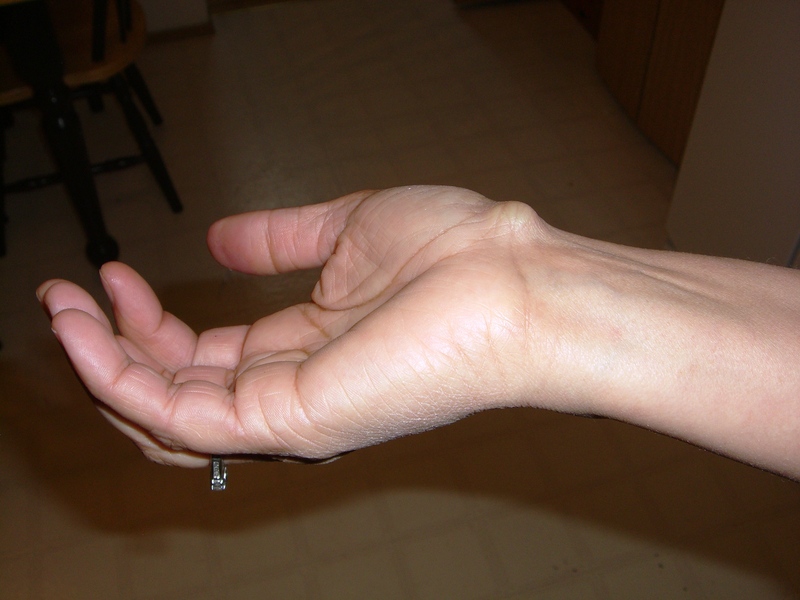 If a ganglion cyst is symptomatic, it can be managed by aspiration or excision. Aspiration of the cyst is the simpler of the two procedures, but cysts recur in more than 50% of cases. With surgery, the recurrence rate is reduced to only 5 to 10% if the check valve at the joint capsule is removed. 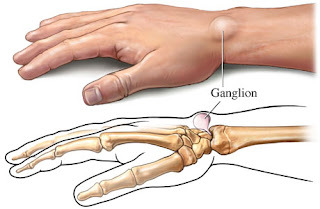 What can be done for a ganglion? Treatment for wrist ganglions may be either surgical or nonsurgical. The relative risks and benefits of any ganglion treatment should be considered carefully. 1) Observation is often sufficient "treatment" for wrist ganglions. Ganglions typically are harmless and do not grow worse over time. Nor do they usually cause damage to the tendons, nerves, or the joint as a whole. Additionally, as many as 50 percent of wrist ganglions may eventually go away by themselves. 2) Closed rupture with multiple needle punctures is another nonsurgical treatment option for dorsal wrist ganglions. In this procedure, the cyst wall is punctured with a needle, and anti-inflammatory and numbing drugs are injected into the cyst. This treatment can shrink the cyst and alleviate symptoms. However, the ganglion is likely to reappear. Surgery is recommended when the patient feels significant pain or when the cyst interferes with activity. It is also recommended if the ganglion is compressing nerves in the wrist, since this can cause problems with movement and feeling in the hand. Surgery is usually done using regional anesthesia, which means only the arm is put to sleep, but it can be done under a general anesthesia is well.